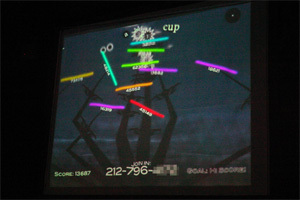 3001 offers a new kind of collaborative musical gameplay. Audience members interact with a large projection screen using their mobile phones and playfully control, create, and perform a live piece of music together. 3001 is a fun and social experience - encouraging both interaction between the audience and the performance space, and interaction between individual audience members. Each audience member uses their mobile phone to check in and control a small avatar on the screen. How this avatar moves around and interacts with other audience member's avatars determines what sorts of sounds, melodies, and patterns will play out of the main sound-system.